West Java Province is located in the western part of Java Island. Its territory is bordered by Java Sea in the north, Central Java in the east, Indian Ocean in the south, and Banten and DKI Jakarta in the west. North coast area is lowland. In the middle is a mountain, which is part of a series of mountains that stretch from west to east of Java Island. That is why West Java is also known as Pasundan Land, because it keeps many mountains with incredible scenery and exoticism. 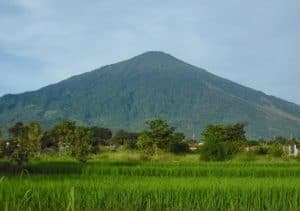 Here is a list of top 10 highest mountains in West Java. 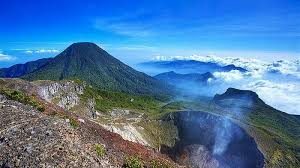 Mount of Ciremai is the highest volcano in West Java with an altitude of 3078 meters above sea level with an area of 15000 ha. This is an active volcano located in three districts of Kuningan, Cirebon, and Majalengka. This mountain belongs to Gunung Ciremai National Park (TNGC). The charm of this unique and beautiful mountain of West Java brass ciremai in the peak makes Mount Ciremai one of the most popular climbing places of the climbers. Ciremai Mountain tour is never deserted from the visit of climbers, especially during the holidays. High Mount Pangrango is 3,019 meters above sea level. Located in the areas of Bogor, Sukabumi and Cianjur, Mount Pangrango has never erupted. 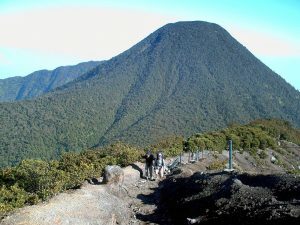 Pangrango Mountain is included in Gunung Gede Pangrango National Park which is one of five national parks which was first announced in Indonesia in 1980. Gunung Gede Pangrango National Park is one of the protected areas in West Java which is quite famous among climbers. 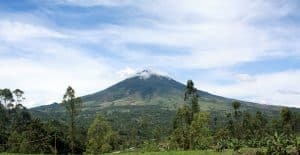 Mountain of Gede and Pangrango are two mountains located adjacent. These two mountains are really favorite mountains for among the trekkers. It is the existence of Mandalawangi valey which became the best spot to enjoy edelweiss. As mentioned earlier, the big mountain is also included in Gunung Gede-Pangrango area. The big mountain has a height of 2958 meters above sea level. It also has some craters that are still active such as Crater of Ratu, Lanang, Wadon, Biru. If Mount Gede has Mandalawangi, Gunung Gede there is also Surya Kencana Square with a very beautiful Eidelweis flower. Mount Gede is located opposite Mount Pangrango. Usually climbers will be interested to climb this mountain also after Mount Pangrango. It would be such a nice moment for you to do a trekking in those two mountains someday. Mount Cikuray is a mountain located in Garut regency, West Java. Mount Cikurai has a height of 2821 meters above sea level and is the fourth highest mountain in West Java after Mount Gede. This mountain is located on the border of Bayongbong, Cikajang, and Dayeuh Manggung districts. Along the way of climbing you will be presented with amazing natural scenery. 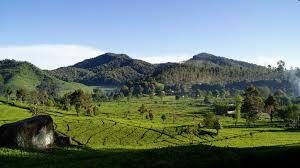 You will pass tea plantations, cauliflower plantations and hills that look so beautiful. The peak is a flat area that is not too broad. You can enjoy a beautiful sunrise with Papandayan mountain background next to it. The mount tourism of Papandayan is one of the favorite natural attractions in Garut. Papandayan tourism complex offers natural beauty in the area of the volcanic eruption of a large volcanic eruption, dead areas of former eruption, and also edelweis plaster very broad plain. The height of the Papandayan volcano approximately 2665 meters above sea level and including the category easy for climbing or just hiking. At this point you can also enjoy the wide crater area complete with very beautiful scenery. You will also find the edelweis flower beds are very eye-catching. The mount of Kendang is located in the village of Neglawangi Pangalengan, Bandung – West Java. The height of this mountain is 2617 meters above sea level. This is a stratovolcano mountain. The peak of this mountain is the highest land in Bandung. Once you at the top of this mountain, you can see the beauty of universe of Bandung city. 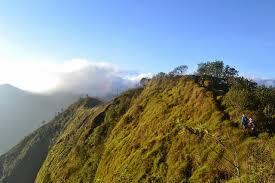 As you climb this mountain, you will be presented a stretch of tea gardens along your trekking journey. 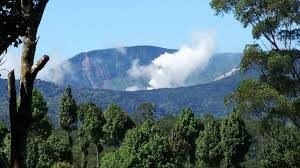 In Gunung Kendang there are four Fumarol field arenas including Manuk Crater, along with a 2.75 kilometer crater area. Gunung Kendang has sublimation Sulfur, hot mud explosions, & Hot springs. This mountain is located in Ciwidey area, Rancabali, Bandung. With a height of 2386 meters above sea level, Mount Patuha has a very exotic crater, it is called Kawah Putih. The crater is formed from the eruption of the Patuha mountain has a crater wall and white water. Mount Patuha has a forest area of Dipterocarp Hill, Upper Dipterocarp Forest, Montane forest, Ericaceous Forest. or mountain forest. Not only that, Patuha Mountain has one crater Kama Putih which is now used as a tourist attraction. Kawah Putih Lake has its own characteristics and uniqueness. The water on the crater is always changing the color. Sometimes it’s apple-green and bluish in the sun, but when the weather is clear, sometimes it’s brown milk. But sometimes it appears white with a thick fog against the field above the surface of the crater. Mount Guha is adjacent to Gunung Kendang. Its height reaches 2397 meters above sea level. This mountain never erupted before. In this mountain, predicted there are Javan tiger herds that live and live in the forest. Recently, there is a plan to build a cement factory near the area. This mountain has never been used as an object of climbing because the terrain and the land have not been known. In addition, the numbers of wild animals that still live on this mountain makes climbers do not glance at this mountain. Mount Malabar is located in Banjaran, Bandung regency. Malabar is a fairly wide mountain located in the southern city of Bandung, with its highest peak at an altitude of 2343 meters above sea level (called a large peak) is quite easy to reach from the Pangalengan area. Formerly this mountain has a very famous radio station in the Dutch colonial era. However, now it has only left the walls of the ruins alone. There are four peaks on this mountain, the peak of Malabar, Puntang, Mega, Haruman, and Mega. Puntang Peak has the most beautiful scenery among others. 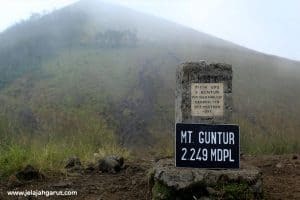 Mount Guntur is located in Sirnajaya, Garut regency. This mountain is a stratovolcano with a height of 2249 meters above sea level. This GUnung was once a very active mountain in the 18th century. It also has a very large caldera which is a former eruption. 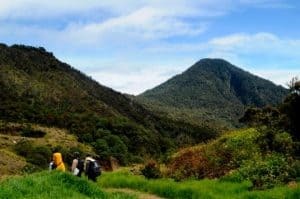 Incorporated into a trio of PaGuCi with Papandayan and Cikuray, Guntur is one of the mainstay destinations of Garut city for climbing tours. Although the mountain is much climbed, the trekking route in Guntur is extreme because of its unpredictable weather. Those are the ten highest mountains in west Java. For those who likes to trekking, it is recommended to hike on one of them. You would get the different sensations that you’ve never felt before. However, be careful of some dangers that might be harm yourself.